Background: Maternal mortality is an indicator of the quality of obstetric care in a community directly reflecting the utilization of health care service available. It differs from place to place, country to country and institute to institute reflecting the type of care provided and health Status of the region 1. In general, the health of mothers and children is central to global and national concerns, and improvements in maternal and child survival are two important millennium development goals. Apart from the obvious linkages between health programmers, mother and child health is intimately bound up with economic development, education, gender issues and rights. Although most pregnancies and births are uneventful, approximately 15% of all pregnant women develop a potentially life-threatening complication that calls for skilled care and some will require a major obstetrical intervention to survive. For an individual woman, the risk of maternal death is influenced both by the risk associated with pregnancy and by the frequency of pregnancy. Each time a woman becomes pregnant, she runs the risk of maternal death again, and the risk adds up over her lifetime. In developing countries, where both mortality and fertility tend to be high, the lifetime risk of maternal death can be astoundingly high 1, 2, 3. Women who die due to pregnancy-related causes are in the prime of their lives and are responsible for the health and well-being of their families. Many women shoulder a double burden of helping to support the family by working outside the home and taking full responsibility for household duties and child care. Yet, despite this vital role played by women in society, the high level of maternal mortality in many poor countries is strong evidence of the neglect of the health needs of women 4, 5. Every minute, everyday a women dies in pregnancy or childbirth. The loss of a mother shatters a family and threatens the well-being of surviving children. Evidence shows that infants whose mother die are more likely to die before reaching their second birthday than infants whose mother survive. And for every women who dies 20 or more experience serious complications. What is more unfortunate is that the vast majority of deaths need never have happened and it is shocking to learn that about 99% of these deaths occur in developing countries like Ethiopia 5, 6, 7. Ethiopia’s maternal mortality ratio (MMR) declined from 871 deaths out of 100,000 live births in 2000, to 673 deaths in 2005 but somewhat increases to 676 in 2011 8. in addition 25,000 maternaldeaths were also occurred and this rate is still too high. Several studies indicate that the major causes of maternal deaths are essentially the same around the world. The major pregnancy-related complications leading to maternal mortality are postpartum hemorrhage, puerperal infections, and hypertensive disorders of pregnancy, obstructed labor, and unsafe abortion. In Tigray the focus of this study have a maternal mortality of 505-758 out of 100,000 live births and this is the major public health problem in this regional state 9, 10, 11, 12. Ethiopia’s target is to reduce maternal mortality by three fourth by 2015 like others countries is off-track with respect to this goal. The Therefore, this study was aimed to assess the pattern of maternal mortality and to identify factors associated with maternal mortality in Tigray region. Study area and period: This study was conducted between May - December 2012 in all public hospitals of Tigray regional state northern Ethiopia. Tigray is bordered by Eritrea to the north, Sudan to the west, Afar regional state to the east and Amhara regional state to the south. According to the 2007 Population census of the Central Statistic Authority the projected population of Tigray for 2012 is estimated to be 4.8 million. The gender composition is 49.2% male and 50.8% female. Eighty five percent of the population lives in rural areas 6, 13. Tigray has 7 zones, 52 districts and 712 administrative sub districts. Mekelle is the capital city of the regional state. In the region, there are 14 public hospitals which are one specialized referral hospital, 6 zonal hospitals and 7 district hospitals. In all hospitals emergency obstetrics care services were provided except Quiha hospital. In addition, there are 218 functioning health centers and 700 health posts based on Tigray regional health bureau 2004 EC.In addition the maternal health coverage of this region is ANC coverage 50%, skilled births 12%, postnatal care with the first 2 days after birth 13% and maternal mortality 676 out of 100,000 live births 7, 14. Hospital based unmatched case control study was conducted. The source Population of this study was Cases: all the charts of mother’s who died due to pregnancy related complication during pregnancy, labor & delivery and up to 42 days after delivery in Tigray public hospitals from 1st of July 2010 to 30th of June 2012. and Controls: All the charts of mother’s who gave birth in Tigray public hospitals from 1st of July 2010 to 30th of June 2012 and surviving. Where as the Study Population were Cases; all the charts of women who died during pregnancy, delivery and 42 days after delivery in the 11 hospitals between 1st July 2010 and 30th June 2012. and Controls; All charts of women who give birth in the 11 hospitals during the target years and surviving. The sample size was calculated using Epi info 5.2.1 and the required sample size was 310(62 cases and 248 controls). The assumption used for sample size calculation were: 95% CI, and 80% power, 2.5 odds ratio and case to control ratio of 4:1 and the prevalence of exposure among controls were 20% based on similar study done in Pakistan 10. Cases were proportionally allocated to each hospital based on the maternal death records that they have and and was selected by using simple random sampling technique/lottery method from each hospitals. Four controls were included for one case from the selected hospitals by SRS method. Homogeneity of control with cases was considered during selection as much as possible to ensure representativeness of the population from which they drawn. The mothers who were selected as controls were those in the same day who had given birth or closest in time to the mother who died. A standard questionnaire by the World Health Organization (WHO) with minor modification was used to review each charts of maternal death and mothers who gave birth during the study period. Eight data collectors and two supervisors who have BSc in midwifery working in obstetrics and gynecology wards, and who can speak Tigrigna and English language were involved. The responsibilities of the data collectors were filling the questionnaire after obtaining training. The supervisors have been provide all items necessary for data collection on each data collection day, checking filled questionnaire for completeness and addressing problems raised during data collection. On each data collection day some percent of the collected data was reviewed by the principal investigator, any problem faced during data collection was discussed and immediate solution made. Sources of information of the study subject were obtained from reviewing charts in delivery ward, operating theatre and health management information system registers. Data that were collected on paper forms were entere, cleaned, coded and analized by SPSS version 16. Frequencies and sorting of each variable was used to check for missed variables, outliers and errors. Independent variables that associate with the dependent variables were included in the model for multivariate analysis using logistic regression. Graphical presentation such as tables, line graphs and pie charts were used to present the result findings of the study. The Independent variables was socio demographic characteristics, obstetric characteristics (Gravidity, gestational age, birth attendants, length of labor from admission, mode of delivery and antenatal care attendance), factors directly associated with maternal death (hemorrhage, unsafe abortion, pregnancy induced hypertension, obstructed labor (prolonged labor, sepsis) and Dependant variable was maternal death. Ethical clearance was obtained from Mekelle University, college of health science; Research and community service Ethical Committee. Official letter was obtained from Tigray regional health bureau and permission was obtained from the hospital directors to retrieve the datas. Confidentiality of the study subject’s was ensured. Information’s that was obtained from the study subjects were not used for other purpose except in this study. Socio - Demographic characteristics of respondents: A total of 62 deceased women (cases) and 248 controls were included in the study. The mean age among the cases was 27.6 years (range 18 to 46), and among the controls 26.8 years (range 17 to 42). The majority of the study subjects 240(96.8%) of the controls and 58(93.5%) of the cases were Tegaru in ethnicity followed by Amhara4( 6.5% )of the cases and 7(2.7%) of the controls. In addition 75.8% cases, 37.9% controls were living in rural area. With regard to their marital status, about 60(96.9%) of the cases and 218(87.9%) of the controls were married. Majority of the respondents, 215 (86.1%) of the controls and 56 (90.3%) of the cases were followers of Orthodox Christianity followed by Muslim who accounts for 6(9.7%) of the cases, 32 (12.9%) of the controls respectively. Majority of the mothers, 138 (55.6%) of the control and 54(87.1%) of the cases, were housewives with no occupation. More than fifty eight percent of the cases and thirty percent of the controls had no education (Table 1). Obstetric history of the study subjects: The mean number of pregnancy for cases and controls was 6 and 2.5 respectively and the mean gestational age of the study subjects was 37.8 gestational weeks (ranged 28-43). It was 37.6 (range 29-42) weeks for cases and 37.8 (range 28-43) weeks for controls. .The study also revealed that the proportion of women who received at least one ANC service was higher among controls 193 (77.8%) than among those who died (cases) 23(37.1%) (Table 2). Obstetric complications during pregnancy: Sixteen (25.8%) of the cases women and thirty (14.8%) of the controls were experienced at least one complication during pregnancy. The most common complication during pregnancy among cases and controls was hemorrhage (43.8%) and (39.3%) respectively followed by pregnancy induced hypertension (31.2%) for cases and 32.1% for controls. In addition about 25% of the cases and 10.7%) of the controls had mal presentation during pregnancy (Table 3). Delivery history of the study subjects: The mean length of labor pain after admission was 14.2 hours for all study subjects. It was 19.5 hours for cases and 11.2 for controls. Regarding mode of delivery, the percentage of women who had operative delivery like c/section, assisted vaginal delivery and destructive delivery was 29(46.8%) for cases and 48(19.4%) for controls respectively. In addition 66.1% the labor among cases and controls were assisted by midwive which were 38.7% ofcases and 73% of controls.Similarly 22.6% of cases and 2.4% of controls had stayed for more than 24 hours on labor pain in the hospitals from addmission (Table 4). Patterns of maternal death in the public hospitals of Tigray: During the two years retrospective study between1st July2010 to 30th June 2012 in public hospitals of Tigray regional state, 62 women who died due to complications of pregnancy and child birth within 42 days of delivery (cases) and 248 women who gave birth and survive (controls) were selected to see their patterns. In the 1st and 2nd years of the study, the case distribution was 28 and 34 respectively which was increased by 9.7% (figure 2). The highest maternal death was observed in Sihul (the former Shire hospital) which accounts 16(25.8%) followed by Lemlem Karl (Mychew), Kahsay-Abera, Adwa and Alamata hospitals 7(11.3%) each respectively (Table 5). 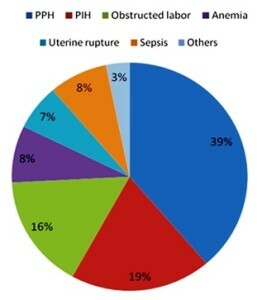 Causes of maternal death among the study subjects: Major causes of maternal deaths were hemorrhage after delivery (PPH) and PIH (pre-Eclampsia, Eclampsia) which accounts 39% and 19% respectively followed by obstructed labor (16%), sepsis (8%), uterine rupture (7%) and anemia (8%) (Figure 3). 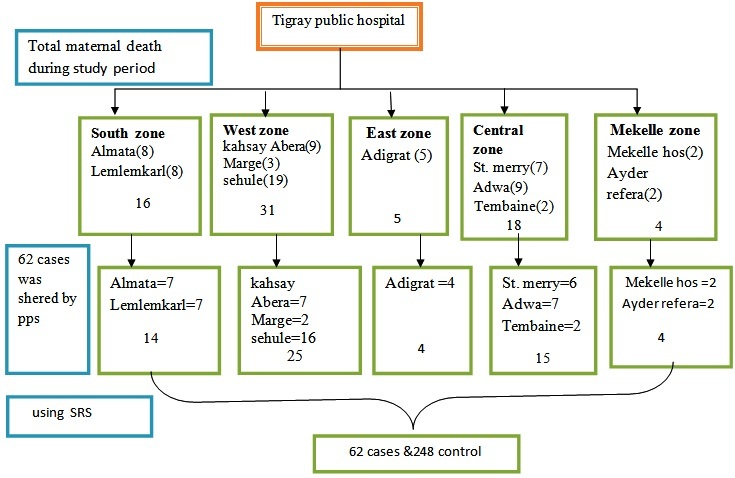 Fifty six (90%) maternal death due to direct obstetric complications and 5 (10%) due to indirect obstetric complications were recorded in the public hospitals of Tigray regional state during the study period (Figure 4). 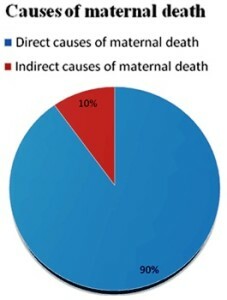 Factors associated with maternal death: The study showed that Level of education, residence, distance to nearby hospital, ANC registration history, number of pregnancy experienced by the women (gravidity), age of the women, types of birth attendants, length of labor from admission and mode of delivery of the respondents were found to be associated with maternal deaths in bivariate analysis. In multivariable analysis only three variables (antenatal care registration history, length of labor and types of birth attendants) have over all significant effect on maternal deaths at 5% level of significant. Thus those respondents who were living in rural area were more likely to occur maternal death as compared to the respondents who were living in urban area [COR=5.1, 95%Cl (2.72- 9.7)]. However, the association was not significant after adjusting for possible confounders. In women’s education the risk of maternal death was higher among illiterate women [(COR=3.2, 95%CI (1.8- 5.66)] than among literate women. In addition the risk of maternal death was protective where the distance of nearby to hospital from the residence was <5km as compared to a distance >5km [COR=0.27, 95%Cl(0.15-0.50)], similarly the study showed that the risk of maternal death was protective for mothers whose number of pregnancy experiences (gravidity) were between 2&4 as compared with those grandmultiparous (gravidity >5). Similarly the risk of maternal death was 73% times less for mothers who gave birth through spontaneous vertex delivery as compared to those women’s whose labor was performed by operative deliveries [COR=0.27,95%Cl(0.15-0.49)]. After adjusting for possible confounder no significant association was not found between the above all variables. Multiviariate analysis of this study showed that midwives and nurses were protective to maternal death as compared to other skill birth attendance (Masters in integrated emergency surgery and obstetrics) [AOR=0.11, 95%CL(0.03-0.42)] and [AOR=0.10, 95%CL(0.01-0.75)] respectively. the study also revealed that mothers who have had registered for ANC atleast one during pregnancy were protective for maternal deaths compaired to mothers who have no registered for ANC [AOR= 0.26, 95%CL(0.12-0.57)]. Finally maternal death was less likely to occur in women whose labor pain were less than 24 hours from admission compared to women whose labor pain was more than 24 hours [AOR=0.27, 95%CL(0.07-0.89)] (Table 7). DISCUSSION: This study is proposed to assess patterns of maternal mortality and associated factors of maternal death in public hospitals of Tigray regional state. The finding of this study indicated the impact of Women’s education, age, receiving antenatal care, Distance from nearby to hospital, Residence, gravidity,types of birth attendants, mode of delivery and length of labor on maternal mortality. There were differences among the cases and controls in relation to the above variables. In this study the mean age of the study subjects were 28.1 years (cases) and 26.8 years for controls. 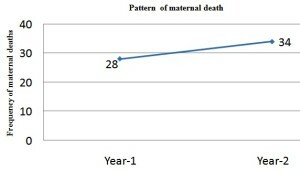 Based on the bivariate analysis maternal illiteracy is found to be associated with a risk of maternal death, studies in Pakistan between 2007-2008 and other areas like in India at Bahir teritiary care hospital, and Nigerya at Adeoyo maternity hospital between January 2003 and December 2004 respectively indicated similar results 10, 15, 16, 17. The possible reason for this result could be illiterate mothers have lack of awareness regarding the seriousness of the maternal health issues, lack of understanding health message and making decision regarding their pregnancy and child birth care. Out of the 310 study subjects 99 controls and 44 cases had to travel over 5km to reach nearby health institution, this is very important implication for the death of pregnant mothers. Moreover this study demonstrated that a significant association between maternal death and women whose residence were rural area which was ≥5km far from nearby hospitals. The result showed that 71% of the deceased women were resides in rural area. This finding was supported with the result observed in Pakistan which showed 61.7% for maternal death due to≥5km distance far away from the health facility to the residence and health facility based maternal death oudit in Tigray between December 2005 and May 2006 18, 19, 20. The possible reason for this could be: the lack of emergency obstetric services, most of the mothers who were in rural area engaged in farm land and they have not time to seek to health institution and lack of empowerment of women to decide by themselves. This study also showed that maternal age between 20-34 years were less likely to die as compared with age between 35-49 years old [COR=0.31, 95%Cl (0.16-0.61)]. This result is in line with a studies conducted in Zimbabawe maternity hospital, 1993 and in high lands northern Tanzania, 2008 14, 15. A possible reason for high risk of maternal death by the age between 35-49 years may be due to weakened uterus, anemia, being pregnant in women more than 35years old by it self is risk for maternal death, and majority of women in this age were not educated. Based on multivariate analysis this study found that more maternal deaths were occurred in women with no antenatal care registration at least once during pregnancy. This result is in line with other studies conducted in Pakistan Preliminary results from the demographic and Health Survey (2006-2007), community based study in India in 2007,Uganda at five Kampala hospitals and Senegal at three high hospitals 11, 16, 17, 18. This may be because:health education was not givien on nutrition, personal hyigen,where they give birth,what was needed for birth and Prevention, detection, and investigation of anemia and treatment of iron-deficiency anemia,immunization against tetanus and promotion of clean delivery may not given and birth preparedness and complication readiness plan may also lost. Since all pregnant mothers are at risk to develop complication , time of delivery is not time of decision making, then mothers who does not ready for their delivery may loss their life and their child because of the unexpected complications that occur during pregnancy and child birth within 42 weeks post partum. This study has also noted that midwives and nurses were protective to maternal death as compared to other skill birth attendance (master in integrated emergency surgery and obstetrics). This finding is similar with study done in Uganda at five Kampala hospitals 16. The reason could be most complicated deliveries were attended by masters in integrated emergency surgery and obstetrics professionals, low experience of this individuals and midwives and nurses may be attended normal deliveries. In addition this study reviealed that prolonged labor has strongly significant with maternal death, thus the risk of maternal death of women who have had taken for more than 24 hours were higher than women who have gave birth within 24 hours. Similar studies done in Nigeria at Adeoyo maternity hospital between January 2003 and December 2004 and Uganda at five Kampala hospitals supported this finding 13, 17. This may be due to maternal exposed to infection, maternal exhaustion, dehydration and high chance of operative delivery complications like post partum hemorrhage and anesthesia releted complication. The two years pattern of maternal death showed that there was increasing maternal deaths among the public hospitals from28 to 34 in the first and second years of the study respectively . This is in contrast with study done in India, Patna Bihar Tertiary Care Hospital revealed that the pattern of maternal deaths were 180 and 149, which was decreased in the first and second years of the study respectively 13. This might be due to high flow of laboring mother to the health institution while they complicated and the registration system was relatively improved. Finally in contrast with other studies, this study did not find a relationship between marital status, occupation, ethnicity, religion, gestational age and obstetric complications like Hemorrhage, pregnancy induced hypertension, sepsis, anemia and DM in pregnancy. This may attribute to the relatively small sample size and lower statistical power to detect differences. CONCLUSION: In order to develop, implement and evaluate policy for reducing maternal mortality, it is essential to study the risk factors associated with maternal death. Thus, Prolonged labor,types of skill birth attendants other than midwives and nurses and mothers who was not registered for ANC during pregnancy were the factors that were found to be associated with increased risk of maternal death. Therefore, the finding of this study has reached to the following conclusions:The two years pattern of maternal mortality shows increment from year to year and women who registered for antenatal care have also less likely to die during child birth. while women with prolonged labor have more likely to die during child birth. In addition type of skill birth attendants other than midwives and nursus have a strong association with maternal death. Smilarly women’s education , gravidity and distance from home to nearby hospital and mode of delivery have an association with maternal death. Strengthen information, education and communication (IEC) and behavioral change communication activities to educate community, especially the rural and uneducated women about reproductive health services and the need for ante natal care follow up. Existing health services should be improved and emergency obstetrical care should be available to all women round the health facilities. Ensuring availability of health professionals trained and experienced in obstetric complications management may significantly reduce maternal mortality. Literacy rate should be improved so that awareness about reproductive health and use of available health resources could be optimized. and further community based case control study should be done. 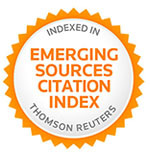 ACKNOWLEDGMENTS: Our deepest gratitude goes to Mekelle University for sponsoring the research. Many thanks also go to Dr. Gebre-ab Barnabas the former head of Tigray regional health bureau for his help in these special undertakings. And we would like to extend our sincere gratitude to the data collectors, and supervisors for their remarkable performance in the study. Pathak D, Chakraborty B, Adhikari S, changing trends of maternal mortality: a comparative study,The Journal of Obstetrics and Gynecology of India, 2011 pg 161 -165. Federal democratic republic of Ethiopia ministry of health, basic emergency obstetric & newborn care (BEMONC) training manual.AdissAbaba:Mnistry of health,April 2010,1st Ed. Abyeji A. Trends in maternal mortality in Ilon, Nigeria. Intl. J. Gynecol Obstet.1998; 63: 183-184. WHO,UNFPA,UNICEF,WorldBank.Reduction of maternal mortality: A joint WHO/ UNFPA/ UNICEF/ World Bank statement. Geneva: WHO; 1999. Starrs A. The safe motherhood action agenda: Priorities for the next decade-Report on the Safe motherhood Technical Consultation, 18-23 October 1997, Colombo, Sri Lanka. Faird M, Nap H. Risk factors of maternal mortality in Pakistan: Preliminary results from the DHS, 2006-2007:1-3. Ganatra BR, Coyaji KJ, Rao VN: Too far, too little, too late: a community-based case-control study of maternal mortality in rural west Maharashtra, India. Mbizvo MT, Fawcus S, Lindmark G, Nystrom L: Maternal mortality in rural and urban Zimbabwe: social and reproductive factors in an incident case-referent study. Soc Sci Med 1993, 36(9):1197-1205. 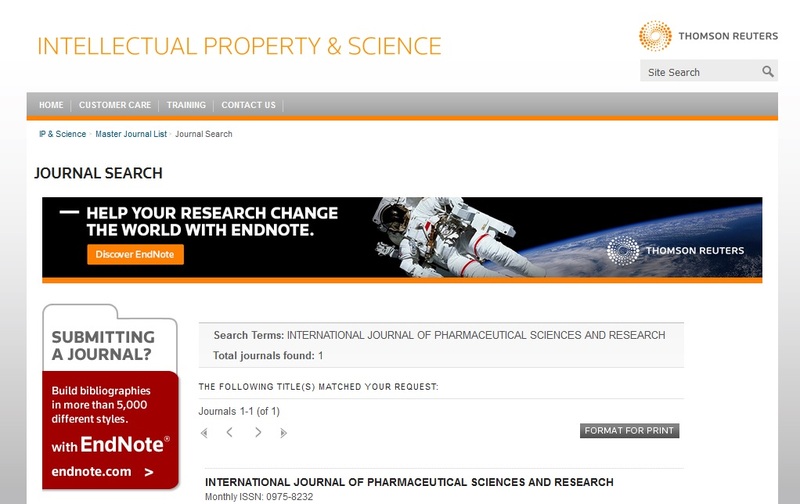 PubMed Abstract | Publisher Full Text. Sven G, Rolv T, Per B, Peter G and Gunneark. Risk factors for maternal death in the highlands of rural northern Tanzania: a case-control study. BMC Public Health. 2008, 8(52 ):1471-2458. Olopade FE. and Lawoyin T. Maternal Mortality in a Nigerian Maternity Hospital: African Journal of Biomedical Research, 2008, 11 : 267 – 273. Garenne M., Mbaye K., Bah, M.O. and Correa, P. Risk factors for maternal mortality: a case-control study in dakar hospitals (Senegal). African Journal of Reproductive Health.1997, 1(1): 14-24. Samuel H, Fikre E, Yemane B. health facility-based maternal death audit in tigray, Ethiopia. J. Health Dev. page 2009; 23(2): 116-118. Gidey G, Bayray A and Gebrehiwot H: Patterns of Maternal mortality and associated factors; A case-control study at public hospitals in Tigray region, Ethiopia, 2012. Int J Pharm Sci Res 2013; 4(5); 1918-1929.